Qualification: Candidates should possess Three years Diploma in Electrical Engineering/ Electronics Engineering/ Mechanical Engineering/ any Engineering Diploma from a recognized University or Institution approved by AICTE OR Any Engineering Diploma. Selection Process : Candidates for appearing in the Written Exam based on the Marks obtained in the Diploma/ higher Course. 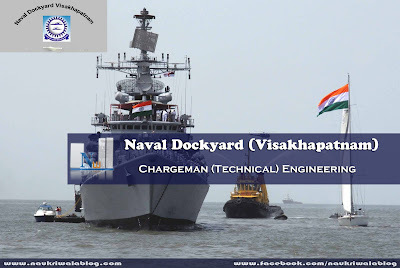 Eligible candidates send their applications on prescribed format of application along with affixing self-attested recent passport size color photograph on it, self-attested copies of all relevant certificates, two self-attested latest passport size color photographs only by Registered/ Speed Post to The Admiral Superintendent (for CAO), Naval Dockyard, Visakhapatnam-14 within 30 days from the date of advt & Seven days thereafter for remote areas. Superscribe the envelope in bold letters as “APPLICATION FOR THE POST OF CHARGEMAN”.